Product information "sensorProbe Bundle - Monitoring Basic Protection"
The new AKCP sensorProbe2 is a intelligent 2 port sensor device for monitoring environmental variations, power, physical threats and security.The SP2 is a completely embedded host with a proprietary Linux like Operating System, including TCP/IP stack, Web server, email and full SNMP functionality. SMS notifications can be sent via a 3rd party email-to-SMS gateway. The AKCP sensorProbe2 works with every intelligent sensor in the AKCP family. You can connect any of our sensors in any combination to monitor temperature, humidity, water leakage, Airflow including long term graphing, security, detect AC Power Line Voltage, Measure Digital Voltmeter, control relays, and many more. Our sensors include an integrated data collection and graphing package to spot trends in the airflow, temperature, humidity. Every sensor comes with our unique autosense feature. Whenever a new type of sensor is plugged in, the autosense will recognize it and re configure the SP2 to begin monitoring it. In the event of an alarm or temperature / humidity threshold being exceeded, it has ability to send alert notification using Email, SMS (via an email-to-SMS gateway) and SNMP Traps. 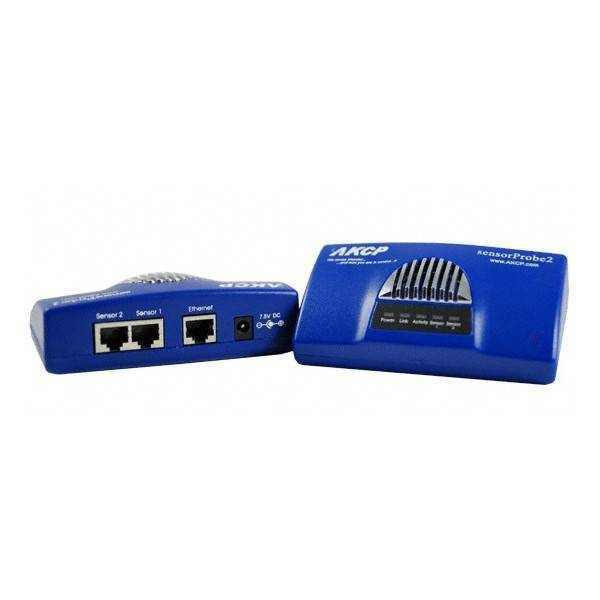 The AKCP sensorProbe2 is compatible SNMP v1 and SNMP configurable. 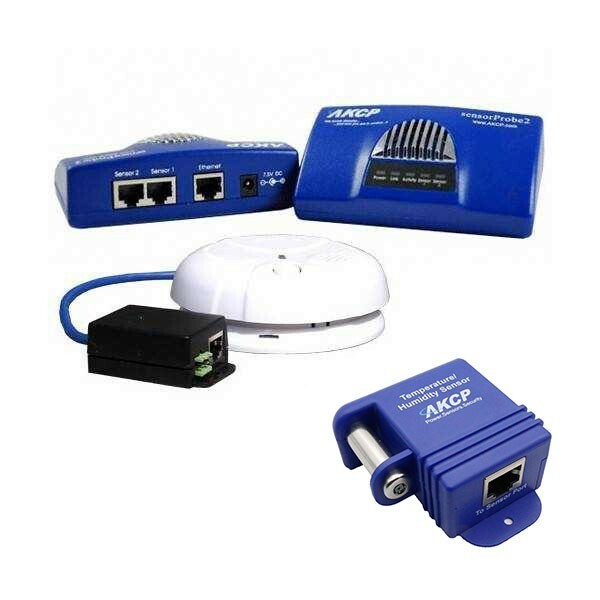 This means that you could integrate AKCP sensorProbe2 (SP2) in leading network management systems (NMS), such as NAGIOS, MRTG, HP OpenView, CA Unicenter TNG, IBM Tivoli, WhatsUp Gold and many more. Didactum® supports you in the planning and implementation of network management systems e.g. WhatsUp Gold or NAGIOS. Each sensor has its own SNMP OID so that data can be collected over the network and graphed using external application like MRTG. The temperature sensor can be read using included SNMP utilities to allow graphing and datalogging at 0.2°C resolution. 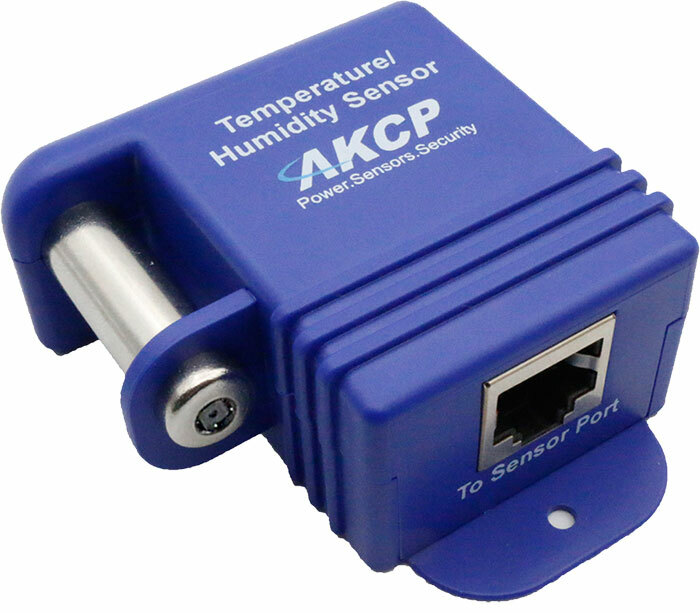 The AKCP temperature and humidity combined sensors are compatible with the sensorProbe2, sensorProbe8 and securityProbe monitoring equipment from AKCP. The connection is made by RJ-45 connectors. For a quick installation are all AKCP sensors combined. Monitoring for developing smoke is an essential aspect in the security and safety of any facility. AKCP has designed a smoke sensor specifically for use with its sensorProbe and securityProbe productline. 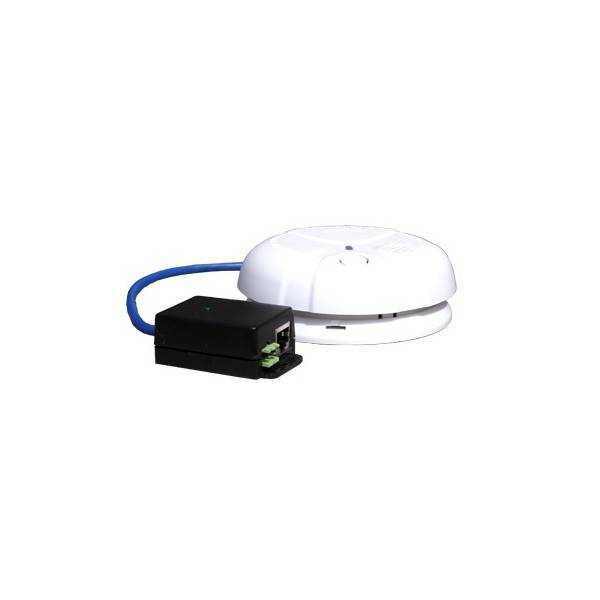 These smoke detectors are easy to install and configure and can be used in conjunction with all other of AKCP’s alerting features. including Single Port Temperature & Humidity Sensor 1,5 m long - extendable to 300 meters. Related links to "sensorProbe Bundle - Monitoring Basic Protection"
Customer evaluation for "sensorProbe Bundle - Monitoring Basic Protection"